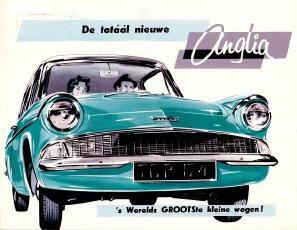 A 215 x 170mm brochure about the Ford Anglia 105E. 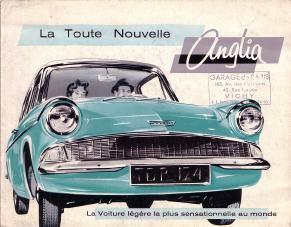 The brochure opens out 3 fold and shows some artist's inpressions of the Anglia's interior and engine on the inside. 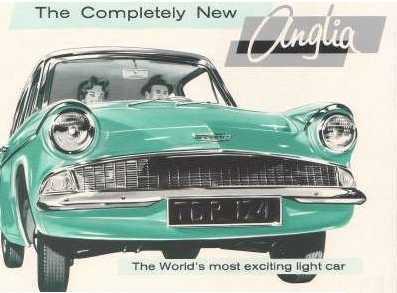 A 215 x 170mm brochure about the Ford Anglia 105E. 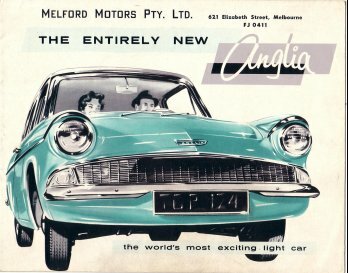 The brochure is the same as the previous one except this one has been printed for Ford of Australia and includes the address of an Australian Ford dealer on the front. 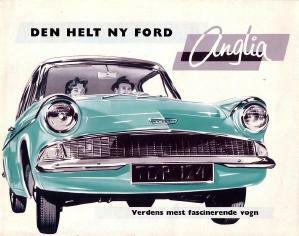 A 215 x 170mm brochure about the Ford Anglia 105E. The brochure is the same as the previous ones except this one has been printed for Ford of Holland and includes the address of a Dutch Ford dealer on the front. A 215 x 170mm brochure about the Ford Anglia 105E. The brochure is the same as the previous ones except this one has been printed for Ford of Holland. A 215 x 170mm brochure about the Ford Anglia 105E. The brochure is the same as the previous ones except this one has been printed for Ford of Denmark.